Fancy a nice old-style text-adventure game? Look no further than Google! It’s quite simple, all you need is Google Chrome (updated). CMD-Option-I if you’re on a Mac. The console is your playground and the game begins! By answering YES to initial question, you’re in! 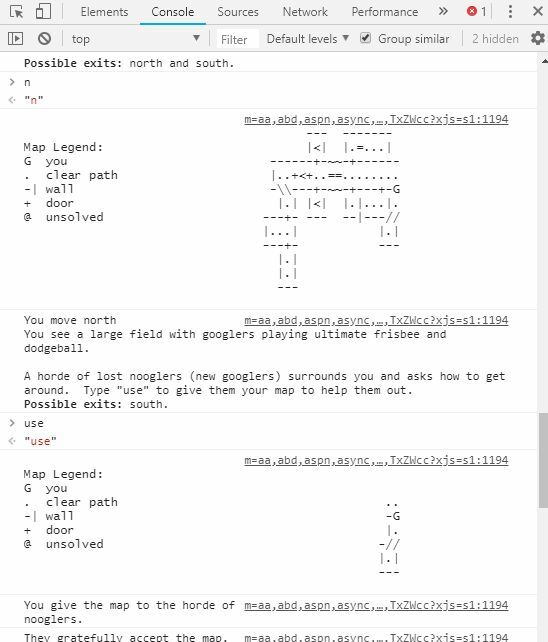 As usual (with text adventures) you’ll be using simple commands. What about some help or a map? You’re welcome: but use the map thoughfully! 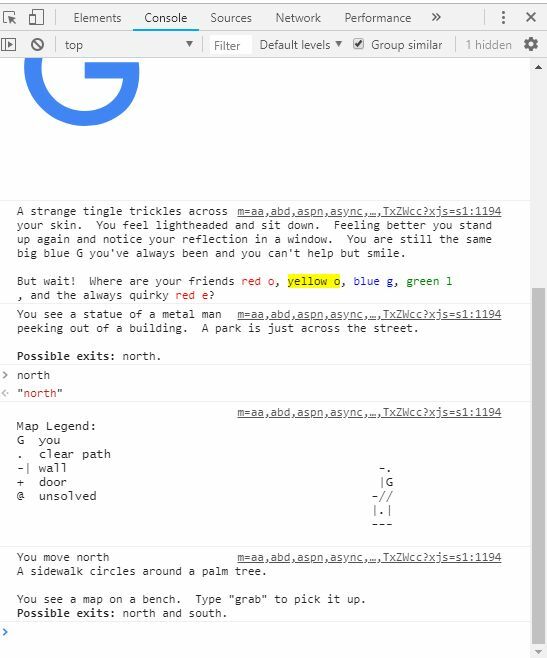 You are the big G in Google’s logo and the aim of the game is to find the missing letters, well hidden within the map. 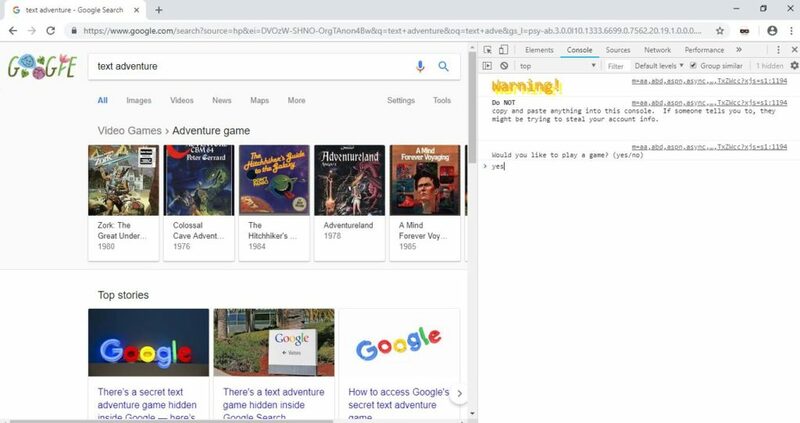 Well done Google, this is truly awesome and brings us to the very best memories of Zork I or Ultima, to name but a few. If you’re willing to face a real challenge, here are some of the very best text games and adventures ever available online for free! As 2018 unfolds I’ve been asking myself how this year has been represented in past movies – namely SF movies and TV shows. Anyway, if you’re curious, like I am about movies set in the (near) future or just to see how they catched up with reality, check this Wikipedia list. 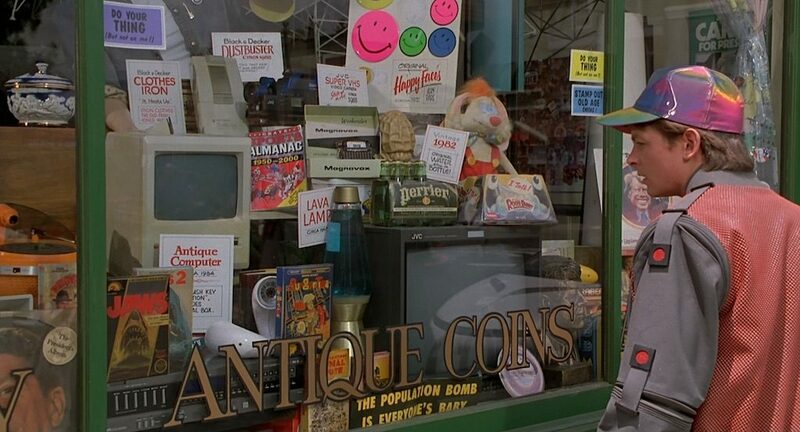 What about Back to the Future Part II (1989)? The well-known sequel starring Michael J. Fox (and his hoverboard) has some hidden surprises in 2015! On October 26, 1985, Dr. Emmett Brown arrives in the DeLorean time machine and persuades Marty McFly and his girlfriend, Jennifer Parker, to travel to the future with him, and help their future children. Biff Tannen witnesses their departure. They arrive on October 21, 2015, where Doc electronically knocks out Jennifer, and leaves her asleep in an alley, explaining that she should not have too much knowledge of future events. He has Marty pose as his own son and lookalike Marty Jr. to refuse an offer to participate in a robbery with Biff’s grandson Griff, thus saving both of Marty’s children from prison. Arnold Schwarzenegger holds some of the very best SF movies positions, even with “The 6th day“, apparently set in 2015 (!). At some point in the indeterminate near future, the cloning of animals and human organs has become routine. Cloning entire humans, however, is prohibited by what are known as “Sixth Day” laws. In 2017, after a worldwide economic collapse, the United States has become a totalitarian police state, censoring all cultural activity. The U.S. government pacifies the populace by broadcasting game shows where convicted criminals fight for their lives, including the gladiator-style The Running Man, hosted by the ruthless Damon Killian, where “runners” attempt to evade “stalkers”, armed mercenaries, around a large arena, and near-certain death for a chance to be pardoned by the state. Set in a dystopian, cyberpunk-themed 2019, Akira tells the story of Shōtarō Kaneda, a leader of a local biker gang whose childhood friend, Tetsuo Shima, acquires incredible telekinetic abilities after a motorcycle accident, eventually threatening an entire military complex amidst chaos and rebellion in the sprawling futuristic metropolis of Neo-Tokyo. One of my all-time favorite is Things to come (1936), directed by William Cameron Menzies which depicts a 2000-or-so future that is worth watching. It is based on H.G. Wells novel and, being just three years before WWII, was astonishingly accurate – and foreseeing. What about Johnny Mnemonic (1995)? Keanu Reeves plays a human-USB-drive with 80-Gigabytes storage capacity (in a futuristic and gloomy 2021)! Travelling around the seven seas may seem too inadequate these days. 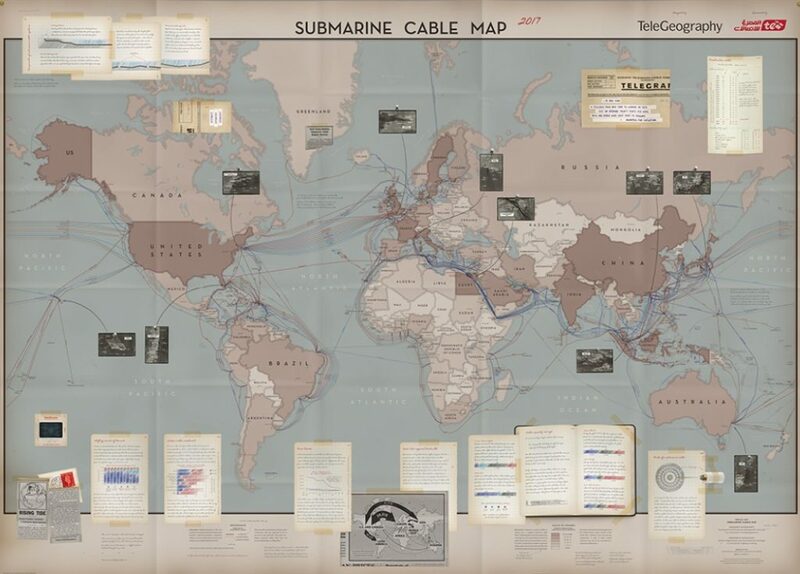 The guys at TeleGeography charted the Internet undersea cable courses with incredible detail – and depicting the whole map as an Indiana Jones journal! Check for yourself this cool, interactive map (and solve the puzzle)! 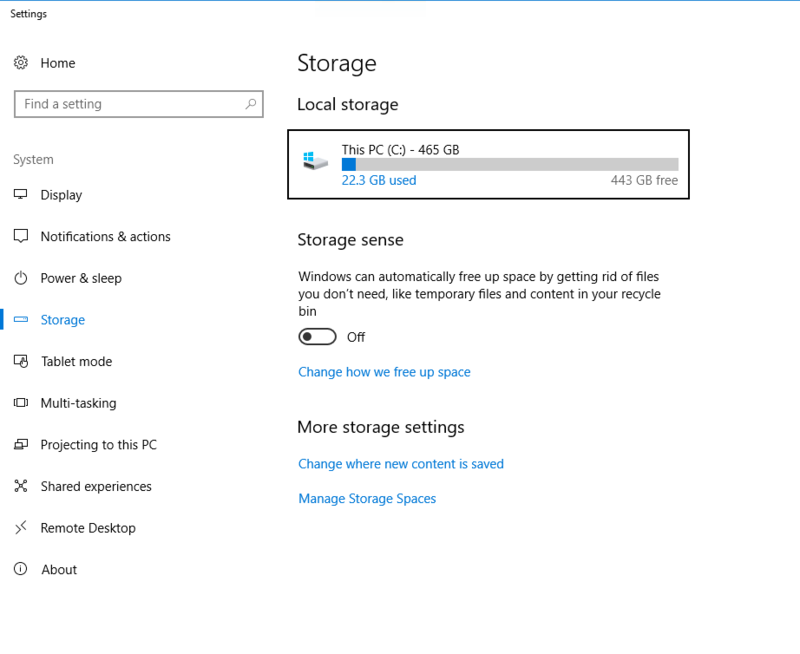 Windows Fall Creators Update (AKA 1709) has been recently deployed to some million PCs around the world; one of the default settings about disk space and storage management may be hurting the way you think about your files: let’s take a look. By default, files in the recycle bin will be deleted after 30 days. As a consultant, I see too many users using the Trashcan just like any other folder: it is commonly perceived as a “see later” folder. Bad idea: both Windows and work logic are against it. Moreover, the Download folder is affected by this update (and the same policy as well): files that have been downloaded and never changed in the last 30 days will be deleted. Again, this is going to turn into a nightmare for plenty of users. The logic besides these storage policies is that documents should go into Documents folder, pictures into Images and so on… leaving uncluttered Recycle Bin and Download. 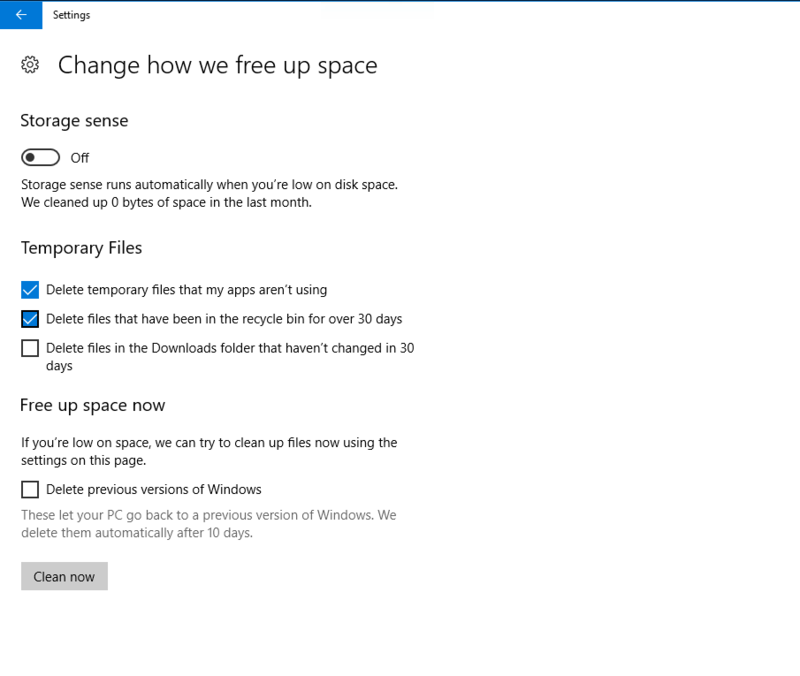 You can check the settings (and decide on your own) by getting into Settings/System/Storage, as in picture, and click on “Change how we free up space” link. – “Delete files in the Downloads folder that haven’t changed in 30 days“: again, you may want to uncheck this one and manage the Downloads folder on your own! As they say: “better safe than sorry”. È una delle novità di Windows 10 1709 (AKA Fall Creators Update): la gestione dello spazio su disco e le relative impostazioni di default. Mi capita molto (troppo) spesso di vedere sui PC di clienti ed amici una gestione del Cestino di Windows molto bizzarra. Spesso, il Cestino viene usato come cartella temporanea con giustificazioni del tipo: “… non sono file cancellati veramente, so che sono sempre lì…”. 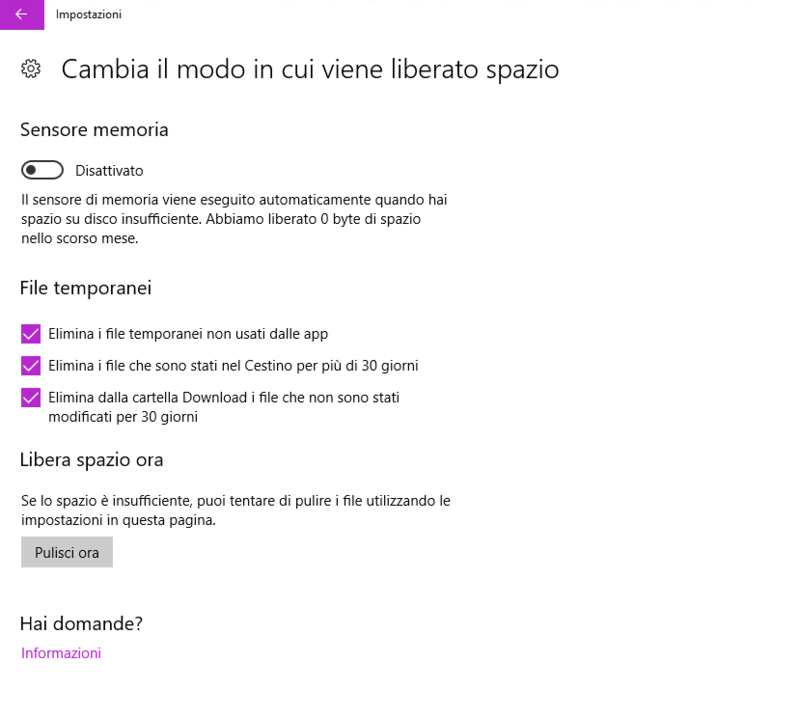 A parte essere una pessima idea, grazie al nuovo aggiornamento di Windows 10, è probabile che ciò diventi un incubo dato che molti utenti si ritroveranno un Cestino disperatamente vuoto. Le impostazioni di default per la gestione dello spazio su disco, svuotano il Cestino per default dopo 30 giorni. L’idea è semplice: forzare gli utenti ad un uso più virtuoso della cartella Documenti (o Immagini, Filmati etc) dove dovrebbe risiedere il grosso dei nostri file. Giusto per sapere come comportarsi, andate su Impostazioni/Sistema/Archiviazione (come nell’immagine sottostante), cliccate su “Cambia il modo in cui viene liberato spazio” e controllate quali siano i settaggi. Partiamo dall’immagine sottostante, in cui sono impostati tutti e tre i settaggi per i “File Temporanei” e che probabilmente NON rappresenta ciò che vogliamo. Il primo settaggio (“Elimina i file temporanei non usati dalle app”) è invece molto utile: ripulisce il nostro PC dai file temporanei, il consiglio è di lasciarlo abilitato. 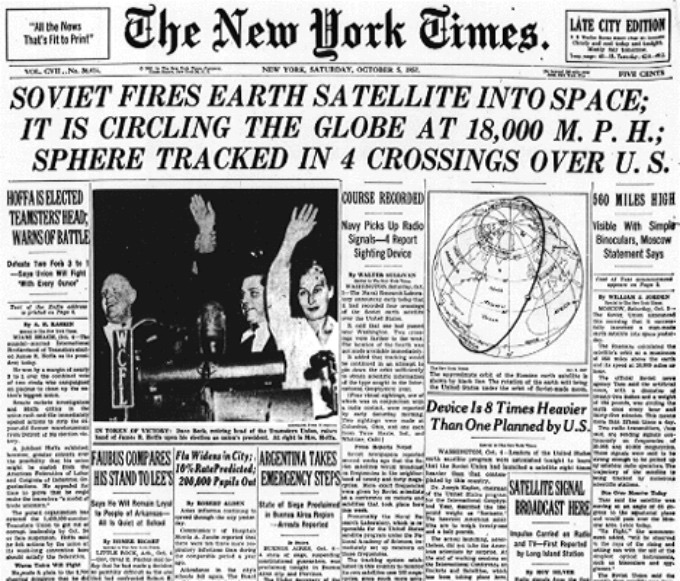 Sputnik 1 launched on October 4, 1957. 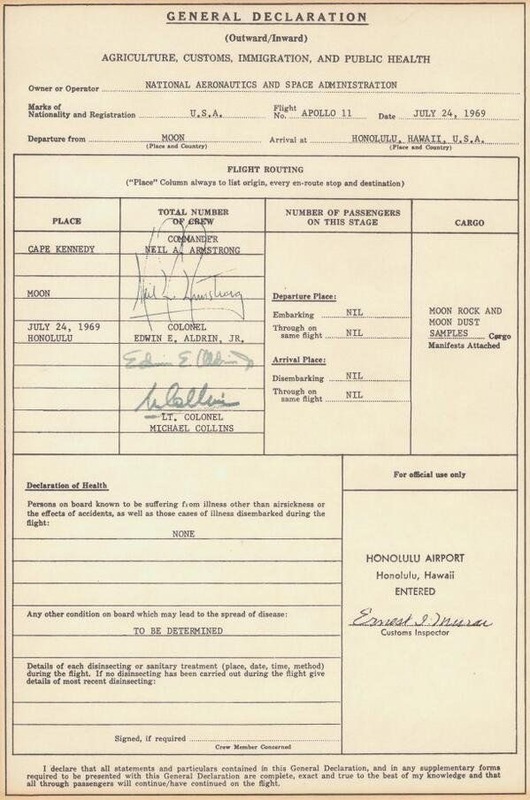 Besides cold war speculation, this was one of the greatest events in space race that sparkled competition, scientific/technical achievements and – eventually, led to 1969 Moon Landing. The satellite was 58 cm (about 23 in) in diameter and weighed approximately 83.6 kg (about 183 lb). Each of its elliptical orbits around the Earth took about 96 minutes. Monitoring of the satellite was done by many amateur radio operators and the Jodrell Bank Observatory. Sputnik’s R-7 booster had previously proven itself more than one month earlier as the world’s first ICBM in the successful long-range test flight of August 21 (with the accomplishment published in Aviation Week). 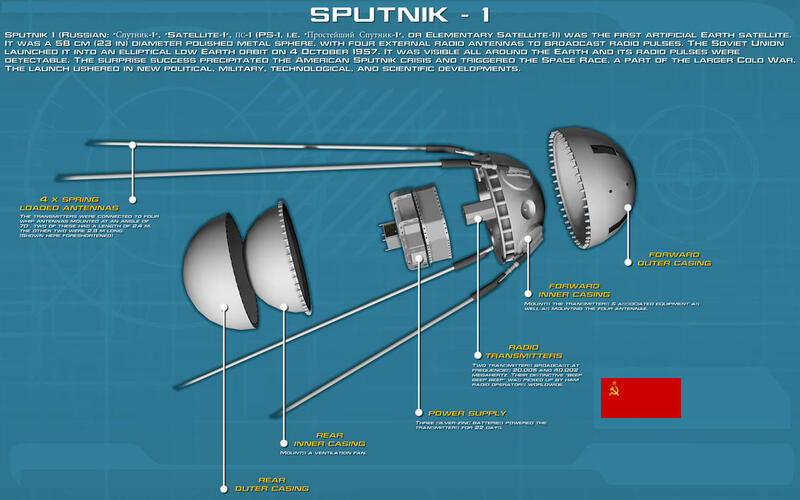 Sputnik 1 was not visible from Earth but the casing of the R-7 booster, traveling behind it, was. 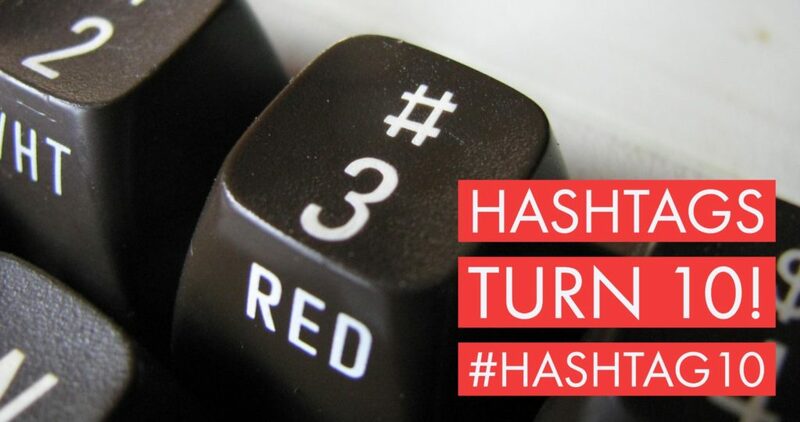 Hashtags turn 10 years old (and counting)! It took quite a bit, but in the end hashtags (and the hash character) took over as a metadata tag, helping Twitter (and many others as well) grouping news, aggregating topics and so on. I can’t remind the very first time I used a hashtag in any of my social profile… can you? “The power is within your reach” says this 1982 TV Commercial introducing the Timex Sinclair 1000, that is Sinclair ZX81, to US computer users. 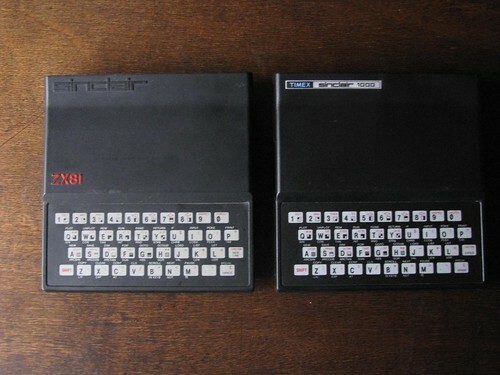 Actually, the TS1000 was the US-version of the well-known ZX81, which was selling hot in Europe. Few changes were made to the ZX81 architecture: 2Kbytes of RAM instead of the standard 1K, NTSC video output instead of PAL and a below-the-case switch for TV-channel. Besides these features, the two computers were almost identical and ran the very same software. The $99 price tag was crucial to most users: the TS1000 was actually the very first fully working home computer to sell under $100. This ignited a price war for US companies like Commodore – its VIC20 street price fell almost immediately, even though somehow related to the Commodore 64 introduction. According to Timex, some 600,000 TS1000 units were sold in USA: quite a good achievement considering the minimal hardware (compared to other US computers) and the dreaded keyboard. These are mine, just for comparison: as you can see, it’s almost the same unit. Fancy a ZX81 online emulator? Here we are, just click this great Jtyone Online ZX81 Emulator and enjoy full browser-based ZX81 features – along with some games too. 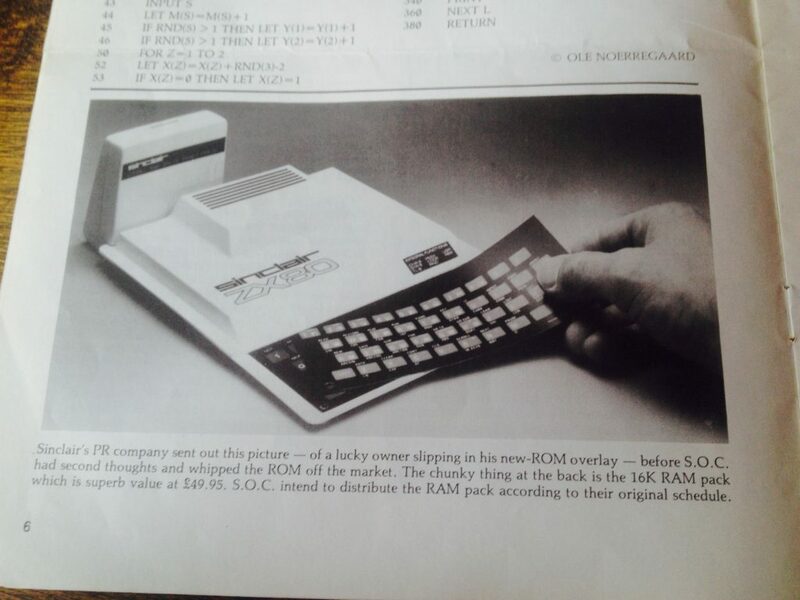 For me, it all began with the Sinclair ZX80 I received as a Xmas gift (1981). I recently purchased this magazine from 1981 (January), it was one of the very few Sinclair-related magazines back then; sometimes you may find similar items such as the original ZX80 manual. 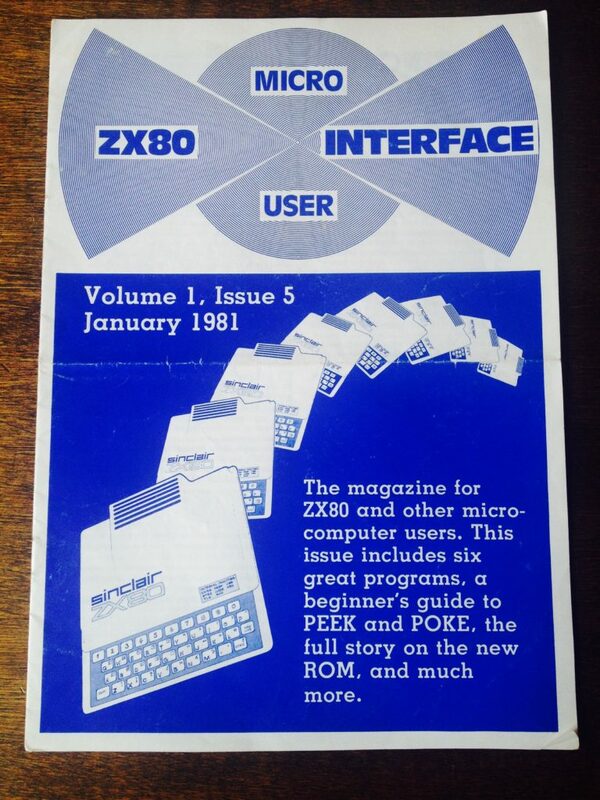 The monthly magazine published by the National ZX Users’s Club for ZX80, (later, even ZX81 and ZX Spectrum). As far as I can tell, it didn’t survive too much other, bigger and less dedicated computer magazines: less than three years should have been published. 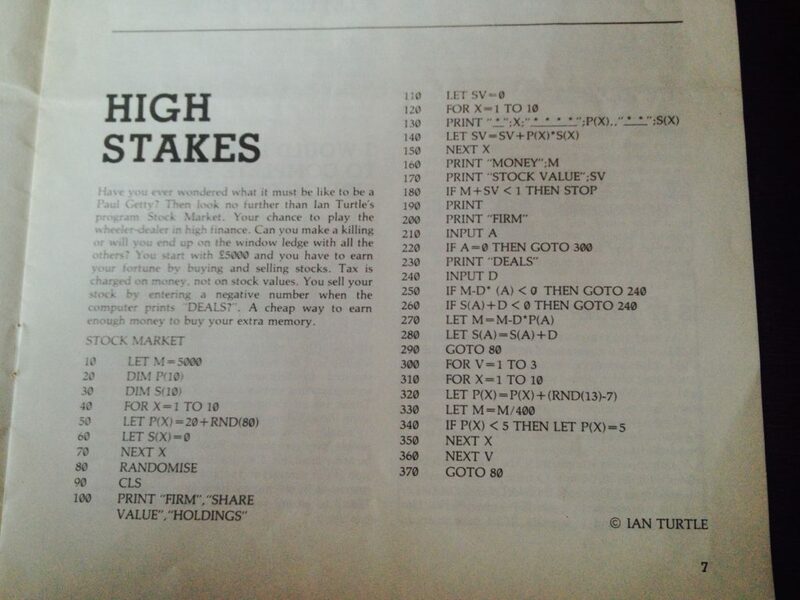 The magazine itself has a very simple layout and consists of very few pages; cover story says you’re going to learn a lot about POKEs and PEEKs (common BASIC commands to write/read values from specific memory addresses). 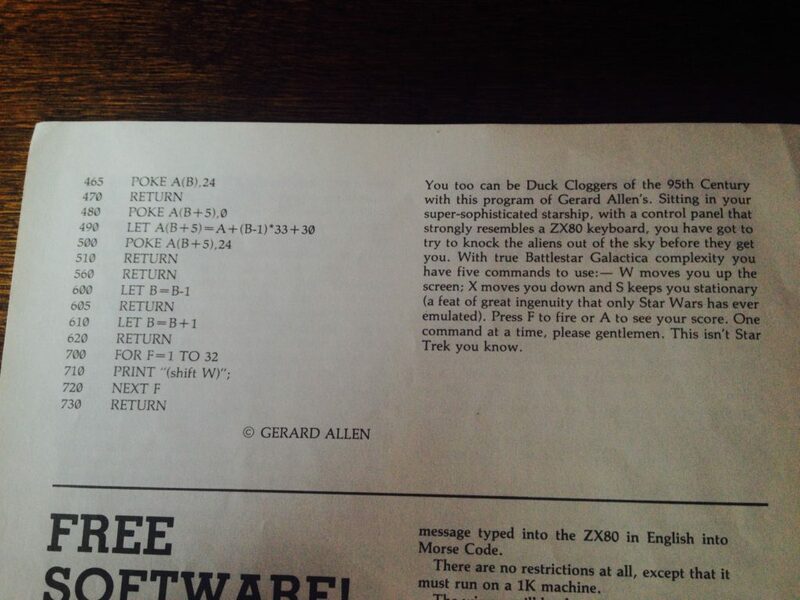 Another game (of course) is Alien Attack: oddly enough, the original ZX80 was unable to display AND deal with keyboard strokes, so, as stated in the instructions “One command at a time, please gentlemen”! 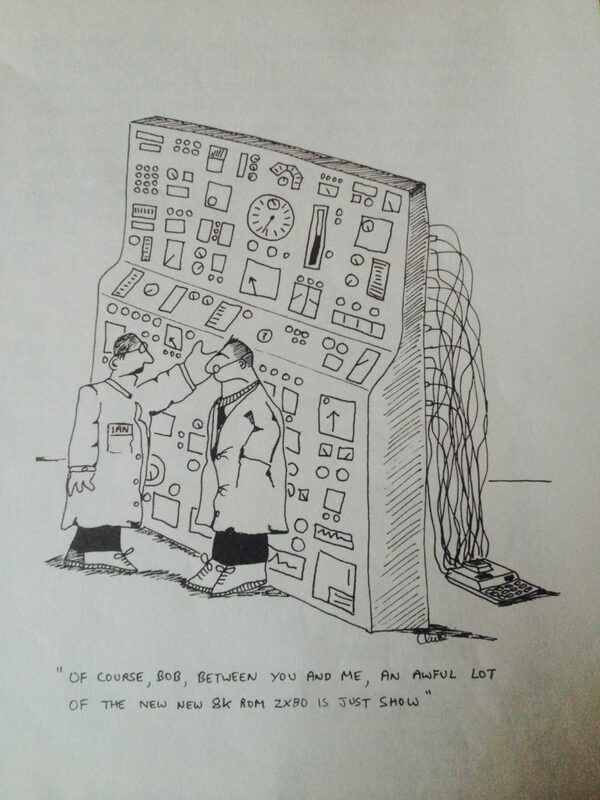 You can’t think of an early computer magazine without some vintage comics, here’s Interface take on the “new” 8K ROM. 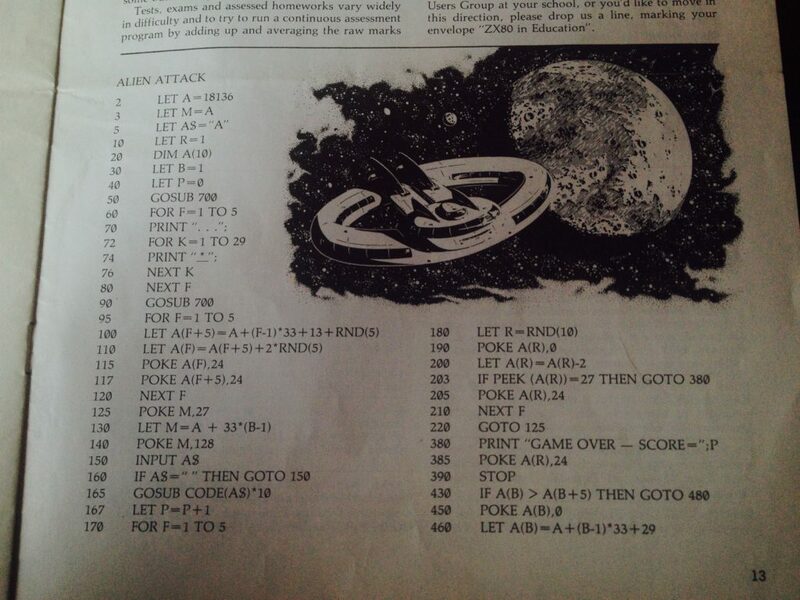 I found very little info: just some scans on ZX81.de.